PDGK seismic station put into operation under CAREMON Project is located on the skirts of Kyrgyzsay settlement (Podgornoye) of Uygur region, Almaty area. The equipment vault in which seismic sensors and recording equipment are installed is constructed on bedrock exposure at selvedge of minor subvolcanic intrusion of trachyte-liparite – trachyte-dacite composition of upper Paleozoic age (τλPZ3) with 1x2 km size. Seismic sensors of the station: seismometer CMG-3ESPC and accelerometer CMG-5TС installed on a pedestal in the equipment vault of 3 m depth. Recording instruments: 24-bit CMG-DM24S6 is installed near the sensors. Sample rate: 100 samples/sec/channel for all channels. Seismic data are digitized according to GPS. 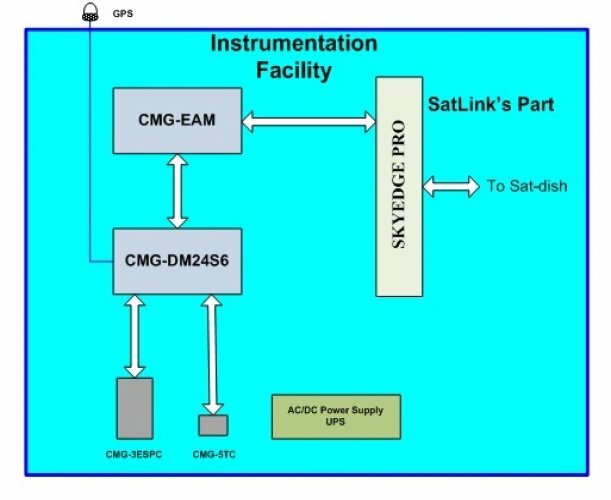 Seismic data are processed by a field computer CMG-EAM and are transferred to the satellite modem via local network. At the same time data are accumulated in the hard disk of this computer. Response and phase characteristics of the installed seismometers are here. Copyright © 2019 Kazakhstan National Data Center. All Rights Reserved.